A Rich Tradition of Gourmet Cheeses. At Old Europe Cheese, we are committed to molding high-quality handcrafted gourmet cheeses and sometimes we like to break the mold a little. This time, in a continued effort to build layers of flavor in our Reny Picot cheeses, we decided to add a burst of summertime to our award-winning Reny Picot Brie. On that note, we’d like to introduce our new Reny Picot Tomato Basil Brie! Tomatoes and basil go together like rama lama lama ka dinga da dinga dong. They are an undeniably classic culinary combination of ambrosia. And when we discovered how welcoming tomato and basil were of Reny Picot Brie as their third wheel, we knew this dynamic duo was about to become a terrific trio. To craft our new Reny Picot Tomato Basil Brie, we took our original double crème Brie recipe and inoculated it will real tomatoes and basil. That’s it. No artificial flavors. No added colors. No nonsense. The result: a soft ripened, creamy cow’s milk cheese coated in a fluffy, snowy white exterior flecked with peppery basil and a plump and velvety interior studded with sweet red tomatoes. Before tomatoes and basil came on the scene, Reny Picot Brie’s melt-in-your-mouth texture and silky smooth flavor profile entertained a symphony of brilliantly buttery, slightly fruity, and mildly tangy notes. The tomatoes and basil harmonize beautifully with all of these notes as the subtle peppery bite of the basil evolves into a slightly sweet flavor while a sweet, intense explosion of flavor from tomato further elevates the fruitiness of the Brie. Needless to say, Reny Picot Tomato Basil Brie will be welcome anywhere you take it. It’s good on it’s own, on a loaf of fresh-out-of-the-oven crusty bread, or dressed up with a drizzle of balsamic vinegar or mound of roasted garlic cloves. Reny Picot Tomato Basil Brie also lends itself well to a number of dishes and adds a refreshing pop of flavor to classic comfort foods like grilled cheese, mac and cheese, pasta, and pizza. 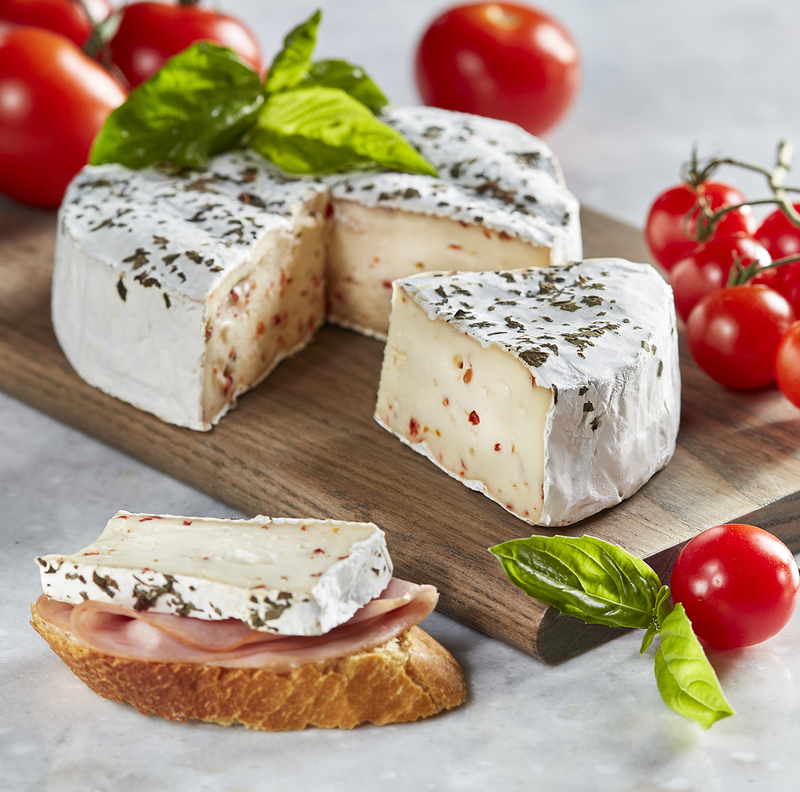 Find our new Reny Picot Tomato Basil Brie in a store near you! Also be sure to visit the Old Europe Cheese Facebook page and share your favorite way to enjoy Reny Picot Tomato Basil Brie—we’d love to hear from you!